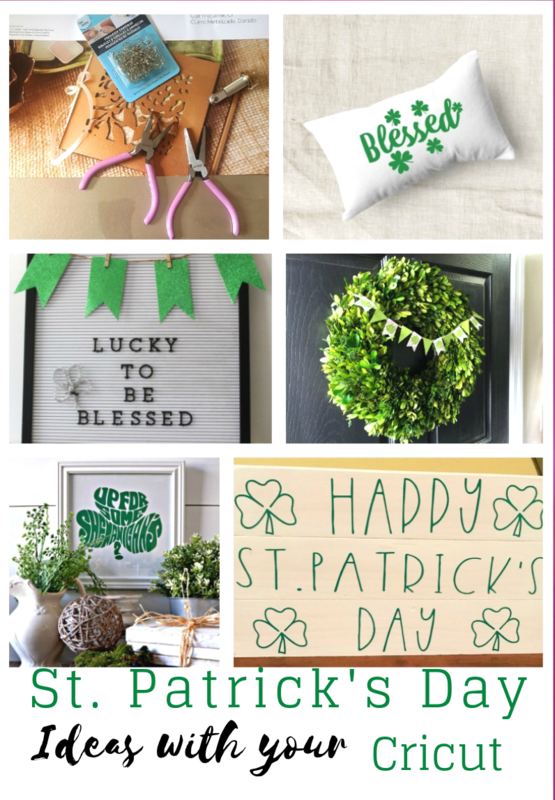 Soon it will be time to decorate for St. Patrick’s Day with all things green and shamrocks! 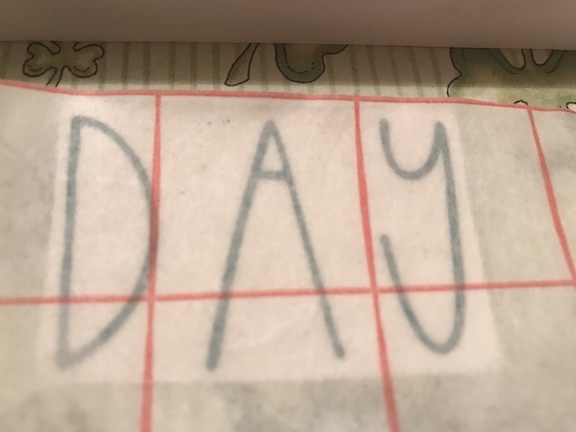 I’ve been on a Rae Dunn kick lately and I just love the simplicity and the hand lettering. 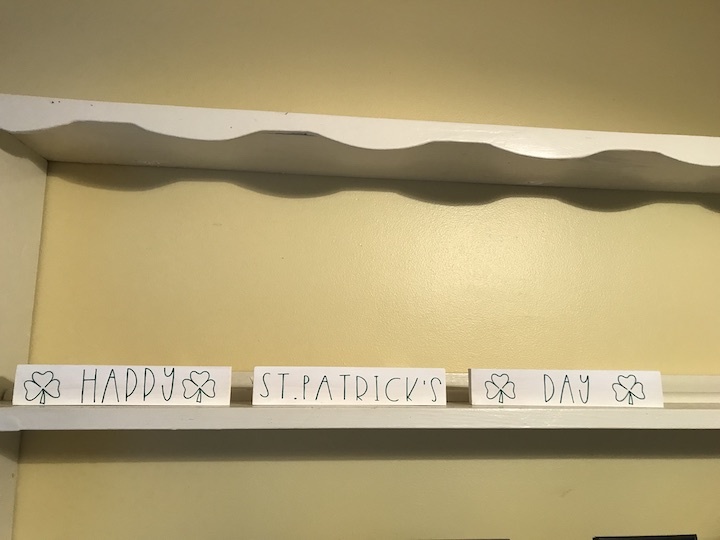 For St. Patrick’s Day I decided to create a Happy St. Patrick’s Day Sign inspired by Rae Dunn. 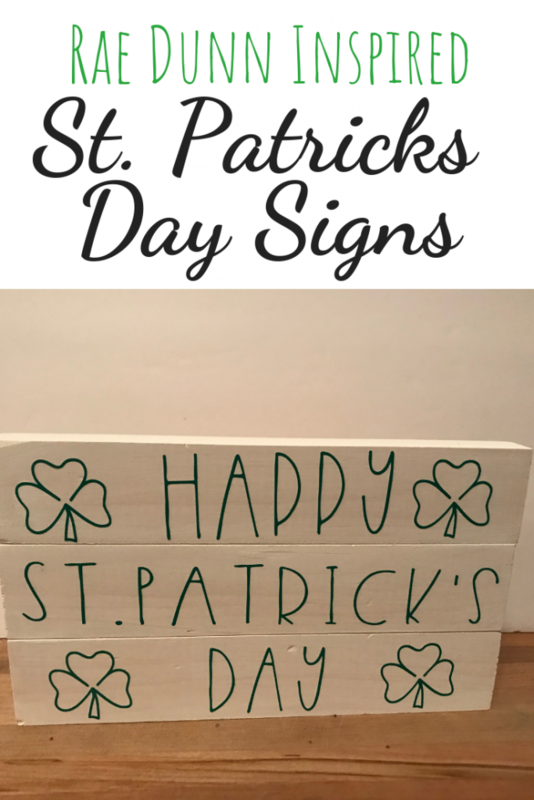 For Rae Dunn decor I created these Ho Ho Ho Blocks and this Reversible sign for Valentine’s and St. Patrick’s Day. 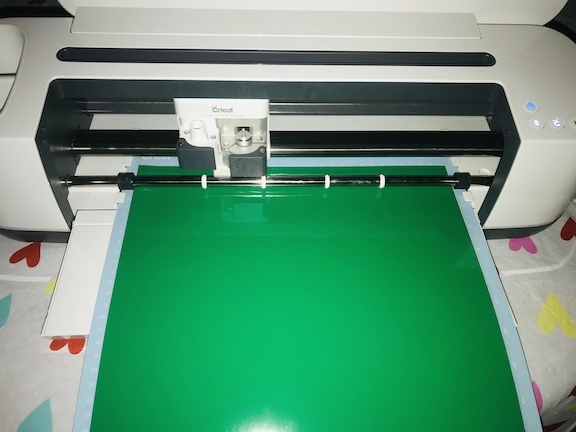 I’ve been so busy with Valentines Day I almost missed out on the amazing opportunity for the St. Patrick’s Day theme with my Cricut friends. So trust me when I say that this is a really easy project. In our scrap wood pile, I found pieces of a 1×2 and my husband cut the three signs 8 inches using the Miter Saw. You can use a different type of saw to cut the wood (if you don’t have a miter saw) and any home improvement store would have this type of board. The board is about $3 and you will be able to make a lot of signs. Then lightly sand the edges. 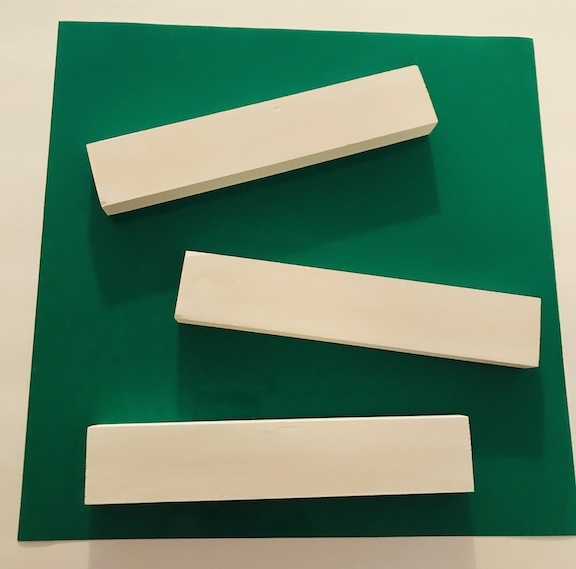 To stick with the Rae Dunn inspiration, I painted my signs white. 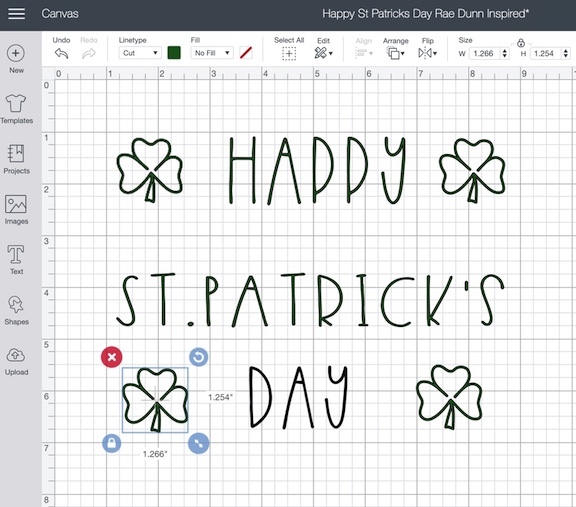 In Cricut design space, I created the Happy St. Patrick’s Day using the Desmond font and shamrocks from Cricut Design Space™ with my Cricut Access Premium. I cut the design using green vinyl from my vinyl stash. This project is coming together and I love it even more when I already have everything I need. These are the best projects right? 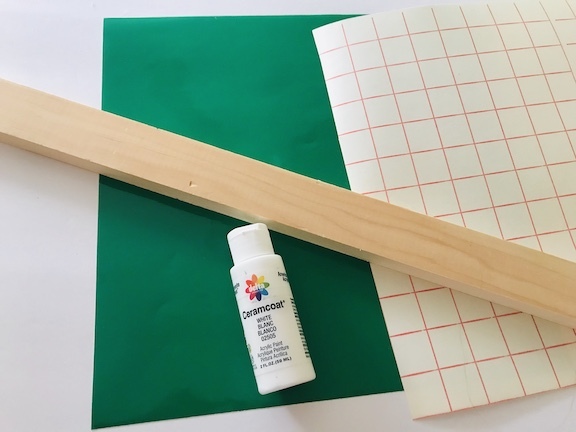 Add your design with the transfer paper and you are all set. Be careful when you rub the transfer tape on because sometimes the skinny fonts can get askew. These signs can be displayed a couple of ways- you can stack them on top of each other or place them in a row separately. 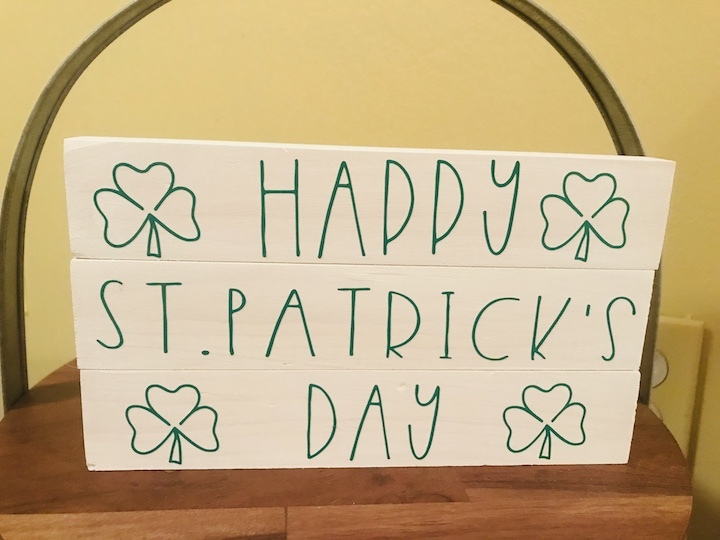 I love the look of the thin font and the outline of the shamrocks, just the right touch for an easy St. Patty’s Day Sign.